I am running low on groceries and I was hungry for something salty, sweet, spicy and tangy. I scoured the cabinets and here's what I came up with. Preheat oven to 375. In a mixing bowl, combine the Jiffy mix, eggs, milk, sour cream and butter till well incorporated (there will be lumps). Add the Tabasco, green onions and pepper. Grease a casserole dish or muffin tin and add the batter. Top with cheese. 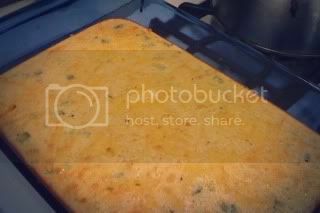 Bake for about 30 minutes or until sides of cornbread are brown. Now if only I had ingredients to make chili. If I had a fresh jalapeño and some frozen corn, I would have added those to this recipe.